While my friends Henry and Iman were visiting me in San Diego we ordered food from Chocolat, a restaurant near my apartment in Hillcrest. My new roommate Ramin had just moved in so he and his girlfriend joined in our order. My other roommate Joe had recommended the restaurant and told me they had gluten free options available; when I studied the menu more I saw that the restaurant offers up gluten free pizzas. When I called to order a gluten free pizza the worker who answered had a lot of difficulty taking my order. I'm mentioning this because she had an insane amount of difficulty, so much so that my mind was blown. I understand that the restaurant may be loud, but if Chocolat offers a take out menu they should be more equipped to accept takeout orders over the phone. Fifteen minutes after she picked up, my order was in. 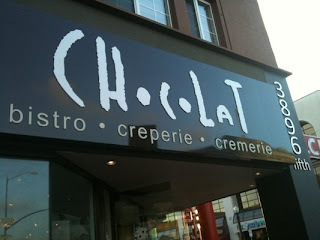 A few minutes after (finally) completing my order, Henry, Iman and I drove up to Chocolat to pick up the food. It was ready to go when we walked in... or so I thought. Luckily Henry checked the bill after we were both taken aback by how much it cost and noticed that they had doubled some of the items we ordered. Again, Chocolat is not well-equipped to take orders of the phone. They deleted the extra food from our order and I paid the correct amount. When we arrived home I bounded up the stairs with excitement for a gluten free pizza. I opened the pizza box and was greeted by a very unattractive gluten free pie. Henry, in solidarity, had also ordered a gluten free pizza and immediately said, "Welp, that was a mistake." I would post a picture of the pizza but the photo quality was horrible... similar to how the pizza looked. Unfortunately the food wasn't only unappealing to the eye but was also seriously lacking in flavor. Having just visited Local Habit and indulged in awesome gluten free pizza I was very disappointed in the gluten free pizza at Chocolat. The lack of a good gluten free pizza, mistake in the bill, and difficulty in ordering over the phone has made me delete Chocolat from list of restaurants in San Diego that I'll visit.